The structure and associated thermal motions of proteins are both intimately connected to their function. Experimental studies and theoretical models have been able to establish some ground rules to connect protein structure and function. For instance, the shape of a protein and electric charge of amino acids on the protein surface can reveal the types of molecules the protein can bind (The human hand shaped polymerase enzyme shown in Fig 1a utilizes a helix-turn-helix structural motif to clutch DNA fragments). Physico-chemical reactions often occur at special active sites inside the protein which contain prosthetic groups (light induced isomerization of a retinal chromophore in rhodopsin, a transmembrane protein shown in Fig 1b, triggers a cellular response in the eye leading to vision). On the other hand, connecting the thermal motions of proteins to their associated function has proven to be a formidable challenge. Why? First, no single experimental or computational method can probe the entire temporal range of thermal motions in biomolecules ranging from femotoseconds to seconds (Fig 1c). Second, it is an open challenge to separate out thermal motions and assign the contributions on different timescales to a particular molecular process. Third, the problem lies at the interface of physics, chemistry, and molecular biology requiring an interdisciplinary toolset/approach spanning areas of Chemical Physics and Dynamics as well as Molecular Biophysics and Imaging . In the department of chemical sciences, we are addressing the fascinating question of how thermal motions drive various protein functions such as catalysis, molecular recognition, cell signaling, and electron transfer through theory and computations. 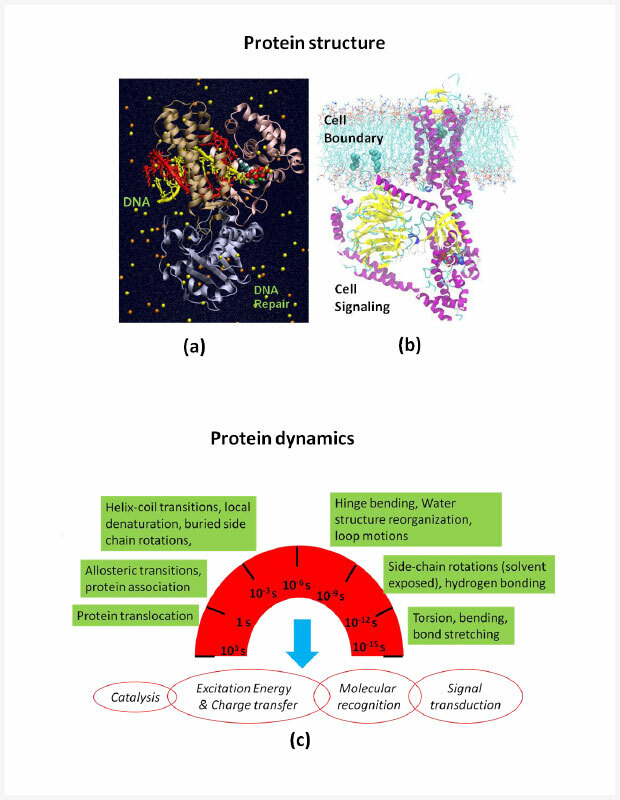 The challenging problem of visualizing protein dynamics on different timescales is being tackled using high performance computational modeling and simulations of proteins under experimental/physiological conditions. In such calculations protein structure is described at varied resolutions ranging from single atoms to entire protein domains. The motion of protein atoms, which is driven by thermal energy, is described classically when no chemical transformations (e.g breaking or forming of covalent bonds) occur. Dynamics with chemical transformations are modeled using a mixed scheme, wherein the atoms participating in the reactions obey the laws of quantum mechanics, and the rest of the protein/solvent atoms obey the laws of classical mechanics. We also build theoretical models to describe processes such as catalysis, electron transfer and optical response within a protein environment. More information about our methods and activities in this area can be found here.